According to this morning's Free Press, Mayor Kwame M. Kilpatrick and the Detroit Department of Recreation intend to sell a total of 92 parks in Detroit. 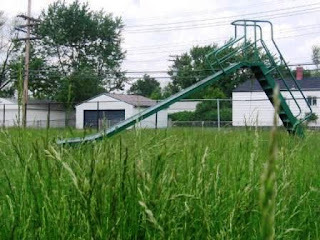 The Lloyd H. Ryan Playground at Greenview and Kirkwood in the Warrendale neighborhood is one of those parks that the City proposes to sell. Any such sale would require approval from the Detroit City Council. According this morning's paper, Council President Ken Cockrel Jr. is concerned about selling so much parkland. "It looks like every park in the city, every small park, is on here," he told the newspaper. "If we sell everything, we'll look up one day, and there won't be any place for kids to play for recreation." I'll continue to follow this story, just like with the proposal to sell much of Rouge Park, and will post what I know here.